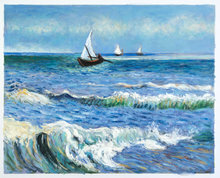 This stunning painting by Vincent Van Gogh is also available as an oil reproduction that you can order for yourself. Made by our talented artists who have studied and analyzed Van Gogh’s techniques for many years. This painting was done in 1882 by Vincent van Gogh, and it was one of the first times he decided to venture and take his canvas outside to paint nature. Though it was in Arles, in 1886 when Van Gogh truly connected with nature and painted several wheat fields, cypresses and other seascapes. It is also easy to see nature’s influence on Van Gogh early on in life. 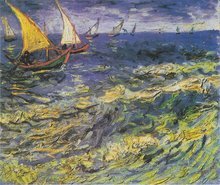 When Vincent was living in The Hague, he would make regular trips to the nearby fishing village, Scheveningen. Since he had started experimenting with oil paints as well, he decided to take his easel on the beach and worked directly on the canvas. As a result, there are still some sand particles on the painting. 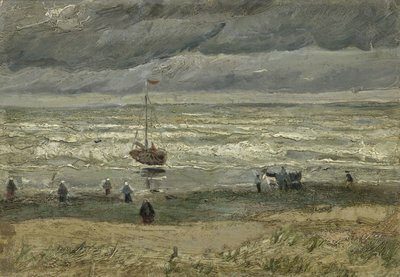 Van Gogh has used thick and bold moves to delineate the sky, water, and sand. He has also used thick and very expressive pigment which completely compliments the lines. The view of the sky has been painted with rough brush strokes and a thick gob of colour. The raging and angry sky in the background with the boat’s flag whipping gives a clear indication that a storm is underway. According to Adriaan Dönszelmann, the managing director of the Van Gogh Museum, the estimated value of both works at the time of the crime was a whopping 4 million euros, or about 4.5 million dollars. 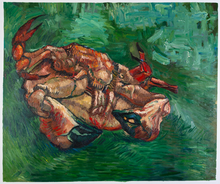 The current market price of the painting is a lot higher than the estimated value in 2002. 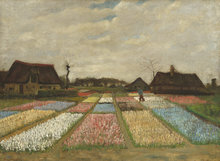 We can be sure the Van Gogh Museum will never sell this painting though.. In a strange turn of events, this beautiful painting was stolen from the Van Gogh Museum in 2002, but in September 2016, it was finally found and brought back to the museum in 2017.